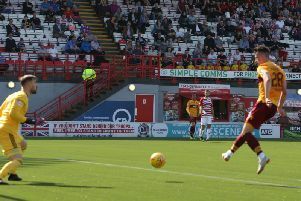 Motherwell manager Stephen Robinson hailed his “fantastic” players for beating Glasgow giants Rangers 2-0 in Sunday's Betfred Cup semi-final despite not playing particularly well. “It was one of our worst performances of the season on the ball in the first half,” Robbo said. "Cedric Kipre was struggling with illness today, and I think that showed in the first 20 to 30 minutes. But he really dug in and probably epitomised the spirit we have. ​"Once we sorted that out after about 30 minutes, I didn't think there was any great threat. And two goals from that man Louis Moult were enough to cement Motherwell a place in the league cup final for the first time since 2005. "It was a brilliant finish from Louis (for his second goal)," Robbo added. "And don't forget Ryan Bowman as well. He was superb alongside him. On his spat with Gers counterpart Pedro Caixinha before both men were sent to the stand, Robbo added: “There was a lot of passion involved and obviously I was sticking up for my players.